Description: Genuine saddle grain leather, open front pocket, interior pockets for passport, travel documents and currency. Velcro closure on pocket. Five business card slits and pen loop. Supplied in a one piece Cutter & Buck® gift box. Features: Pen not included. Cutter & Buck® registered trademark is embossed on the internal left hand side pocket. 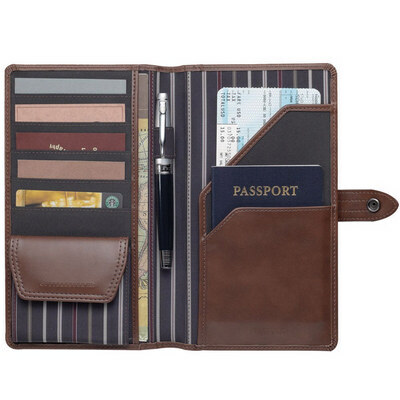 The word passport is embossed on the right hand pocket. With a metal press stud closure engraved also with Cutter & Buck®. The one part gift box is a natural board colour with Cutter & Buck® printed on it. The leather is a tan in colour. Packaging: Wrapped in tissue paper in a polybag and presented in a Cutter & Buck tuck box. Packaging Size: 236mm(h) x 145mm(w) x 29mm(d) Colour: Tan. Material: Leather Product Size: 228mm(h) x 140mm(w) x 12.5mm(d) Freight details : 48 per carton, 12.3kgs, 50.5 x 46 x 27.5cms; Decoration Type(s): Colour Print / Deboss / Debossed Foil / Foil Stamp / Full Colour Print / Laser Engrave Decoration Area: Pad/Screen/Emboss: 50mm(h) x 63.5mm(w). Price includes : 1 Colour 1 Position Print. Setup is included.